In November 1973, all republican PoW’s in Mountjoy and the Curragh jails were transferred to Portlaoise in the Irish midlands. This came in the wake of the daring escape of three volunteers from Mountjoy in a helicopter. In early 1974, minds turned towards plotting an escape from Portlaoise. 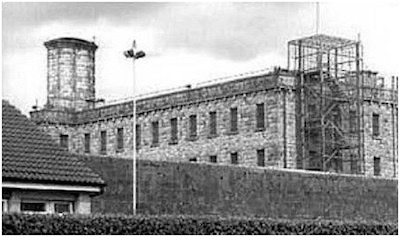 At the end of June an eighty foot tunnel was discovered in the prison which led to a higher number of Gardai and 26-County soldiers being put on duty in the vicinity. Immediately afterwards an alternative plan was formulated, with nineteen prisoners on long-term sentences selected to escape in August. On August 18th 1974, the escapees overpowered the warders in the main cell block shortly after noon. They made their way onto a low roof before rushing through into the courtyard, followed by up to two dozen other PoWs. As the alarm was sounded, the soldiers began to open fire on the escapees. They dashed to the walled residence of the Governor where an explosive charge was placed at a gate leading to the prison walls. A second charge was planted in a doorway and the escapees were soon outside the prison wall. After dashing through the fields surrounding the prison, they reached the Borris road where they commandeered cars and made their way to freedom. Within hours all of them were in safe houses scattered throughout the island. Despite an intensive search, none of the escapees were recaptured and all but three of them were still free at the end of the year. The escape was a huge embarrassment for Liam Cosgrave’s Blueshirt-Labour Coalition. A judicial inquiry was launched by 26-County Justice Minister Patrick Cooney which led to an increased Garda and military presence in the prison and restrictions on food parcels and free association among the PoW’s. The implementation of these measures was to have far-reaching consequences, as conditions in the prison deteriorated rapidly over the following months, eventually leading to two hunger strikes in 1975 and 1977. Those who escaped were Patrick Thornberry, Kevin McAllister and Martin McAllister from Armagh; Liam Brown, Paddy Devenny and Micky Nolan from Belfast; Bernard Hegarty and Sam O’Hare from Louth; Tom McFeely and Ian Milne from County Derry; Thomas McGinty and Eddie Gallagher from Donegal; Francis Hughes and Kevin Mallon from Tyrone; Michael Kinsella and Sean Kinsella from Monaghan; Sean Morris from Meath; Oliver McKiernan from Fermanagh; and Tony Weldon from Dublin.